For the past decade, Marco Stampanoni and his TOMCAT team at the Paul Scherrer Institut (PSI) and the Eidgenössische Technische Hochschule (ETH) in Zürich have been exploring the applications of X-ray interferometry and phase-contrast mammography. Two years ago they spun out a company called GratXray that has implemented a grating-based approach to image the breast. In November last year the company was awarded the prestigious Swiss Technology Award in the inventors category, and it subsequently announced plans to develop a prototype mammography system based on its patented technology. As seen in the schematic diagram above right (all images are © GratXray), the interferometry approach to breast imaging is based on three sequential gratings: the first grating G0 generates coherent X-rays that pass through the patient’s breast; the second grating G1 introduces a reference interference pattern; and the final grating G2 enables the changes in the interference pattern to be read out. This arrangement leads to three complementary images: a conventional X-ray based on absorption; a differential phase-contrast image; and a scattering image. 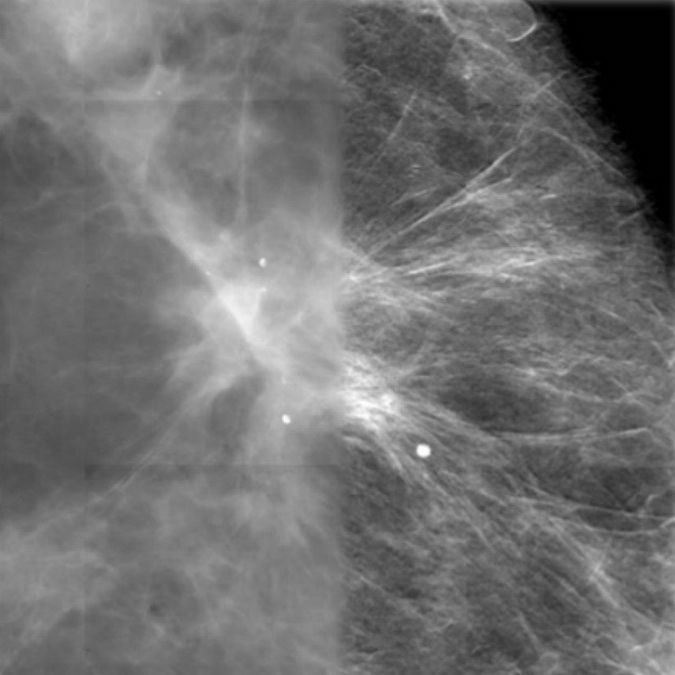 As seen in the image at left, a refraction image based on the gratings approach (right half) provides significantly improved tissue delineation compared to conventional mammography (left half). By combining the absorption and scatter images it is possible to discriminate between different tissue types based on their internal microstructure. The scientists at GratXray believe their system will not only lead to improved visualisation of spiculations that are indicative of a cancerous lesion, but will also enable the identification of malignant microcalcifications. Over the past three years we have reviewed breast computed tomography (BCT) – true 3D imaging – introduced by Koning, based in Rochester, New York, for which it received FDA approval, and another story about a German company now called AB-CT. For both the BCT systems, the woman lies in a prone position with her breast suspended through an opening in the examination bed, with the X-ray source and detector rotating through 360 degrees around the breast. This is the identical approach taken by GratXray as seen in the diagram below right. One of the perceived benefits of this design is that the breast is not compressed, thereby improving patient comfort. Since BCT has thus far only received approval from the FDA as a diagnostic system, rather than as a screening device, it will most probably take at least five years before GratXray can realise its dream of “providing all women access to painless, efficient and precise breast cancer imaging.” That’s nevertheless something to welcome. It would be interesting to know what the price differential is between this approach and CapeRay’s. In the meantime why not get the D 3 AB US Mammography Machine up and running?